Every so often a company gets a great idea about how they might garner so great free publicity. Perhaps some manager or marketing team thinks to themselves, “If we can only get some free press, we could be huge!” The wheels start turning, the ideas start to flow, the budgets get prepared and the next thing you know they are ready to launch the next stunt that will win them the market share (they think) they deserve. Many companies large and small have attempted PR stunts and there are some great examples of successful events large and small that have worked out for the sponsoring company: think Red Bull’s Stratos Mission, with it’s daredevil leap from the edge of space, or Kentucky Fried Chicken’s giant logo in the Nevada desert, or even the granddaddy of them all, the Macy’s Thanksgiving Day Parade. These efforts and others like them garnered tons of free press coverage for their sponsors, generated millions of impressions, and ultimately led to increased awareness and sales. But for every successful PR stunt that is launched by a wide-eyed marketing team, there are dozens of unsuccessful efforts littering the road. Even though the old saw, “there is no bad PR” is still widely subscribed to, real damage can be done when an attempt at a PR stunt fails, in truth the damage done to a sponsoring company’s reputation can be immense (not to mention the expense). Here are 5 legendary examples of PR efforts gone horribly, terrible, awfully wrong. #fail has never had better friends than these! 1. Summer in NYC; World’s Largest Popsicle Melts. Go Figure. 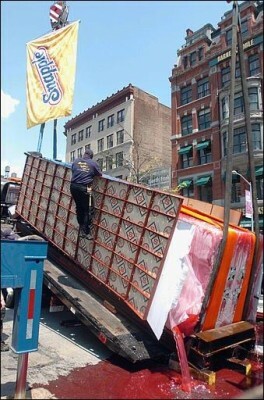 In 2005 the marketers at drink brand Snapple, had a great idea: let’s build the world’s largest popsicle! They figured that consumers and media would flock to cover the story when they unveiled the giant treat in New York’s Union Square. The popsicle would be 25 feet tall and would weigh over 17 tons! Wow. The crowds did indeed gather and the media as well as the folks from the Guinness Book of World Records were all set to document the entire event. But, as Murphy’s law dictates, when something can go wrong, it will and it happened that the temperature shot up into the 80s in New York City that day. Who would have thought? The giant, frozen kiwi-strawberry-flavored confection began to melt and before they knew it sticky fluid was pouring onto the street and sidewalks. The police were forced to close off several blocks of downtown Manhattan and the fire department had to be called to rinse away the sugary syrup. Not surprisingly, Snapple declined to make a second attempt to break the official record, which had been set in Holland in 1997 by a 21-foot ice pop. Oh well. 2. We Built This City. PR Destroyed It. Back in 1896, executives at the Missouri, Kansas and Texas Railway were looking for a way to gin up some excitement, build awareness, and gain some customers who would be willing to buy tickets to Texas. One marketing guru named William Crush came up with a killer idea: create a “temporary” city and the stage a train wreck for an audience of paying spectators. Genius! The new town, named Crush, was built in short order, just for the purpose of having a place for the crash to happen. They erected buildings, set up tents, and even erected a grandstand. Two trains were designated to travel around Texas to advertise the event. The railroad offered discounted tickets for anyone who wanted to travel in to see the “Crush crash” and over 40,000 took them up on the offer. For one day, Crush became the second-largest city in Texas. A special track was built and special safety measures put in place but, shockingly, things didn’t go according to plan. The two trains were set on “full speed ahead” mode and the crew leaped to safety in plenty of time. What no one counted on was that the boilers would explode on impact. When the two trains collided at 45 miles per hour, the debris flew into the crowd killing three people and injuring dozens more. William Crush was fired, the town was torn down after the day of the crash and the railroad gave the victims free passes! Of course the passes were only good for use on the Missouri, Kansas and Texas. 3. Identity Theft Role Reversal. In 2007 Todd Davis, CEO of the identity theft protection company LifeLock, decided to pursue a great new marketing effort. The idea was that he would become the face of the company and use his own image as well as his personal information, including his real social security number, to advertise and promote the company’s services. The effort lasted for more than 2 years, and the company garnered some great media in that time. Unfortunately for Mr. Davis, who claimed that his identity was safe because of his company’s services, it didn’t turn out quite as planned. Sure enough he ultimately had to admit that his own identity had been stolen thirteen times and that 87 other thieves had made the attempt. Davis’s information was used to secure a loan, set up bank accounts, open cell phone accounts, and even charge over $300 to a gift-basket company. Multiple lawsuits were filed, and the company was fined $12,000,000 by the FTC for making false commercial claims. 4. Flyover, Schmyover – How the DOD Rolls. In September of 2001, New Yorkers were shocked by the low-flying arrival of two jumbo jets over lower Manhattan. They watched in disbelief as the two aircraft flew into the twin towers of the World Trade Center. 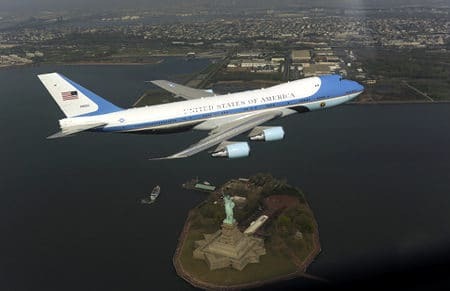 About 8 years later, they were horrified to see another jumbo jet doing a low-altitude fly over near the tip of lower Manhattan, this time circling the Statue of Liberty. Who could blame them for thinking it might be another terrorist attack. But, no, it was not another incident of aircraft being used as deadly weapons, but rather a dimwitted attempt at a photo-op staged by the Air Force. Surprisingly, neither the city’s emergency responders not the Mayor had been warned that the flyover was taking place that day. Widespread panic ensued in downtown New York with thousands of workers and residents calling 911, streaming out of their buildings, and making panicked calls to their friends and families. The aircraft continued their maneuvers, got their shots and flew off, never suspecting the stir they had caused. A statement released by the Department of Defense had this to say, “While federal authorities took the proper steps to notify state and local authorities in New York and New Jersey, it’s clear that the mission created confusion and disruption.” Duh. 5. Aqua Teen Hunger Fail. The Cartoon Network is known as much for outrageous marketing as it is for outrageous content. In 2007 one of Cartoon Network’s marketing firms launched a new campaign for Aqua Teen Hunger Force, a show featuring characters represented as fast-food containers, including one called Frylock and another named Meatwad. Metal forms covered with colored lights in the shape of these characters were hung in public places in 10 U.S. cities, including several in various locations in Boston. One day shortly after the “signs” were placed, a Boston city worker noticed one of them on a highway on-ramp, complete with wires dangling and lights flashing. The police were called and the bomb squad brought in to defuse and detonate the thing. Dozens of roads, bridges, and transit stations were shut down, and the press and social media exploded. Within a week, Comedy Central and the show’s producers and marketers had issued an apology and agreed to pay up to $2 million to the city of Boston.